I'm backtracking a little bit on our way down the coast. We stopped in Ventura, and guess what was there! Another of the chain of 21 missions founded in the late 1700s. Mission Santa Buenaventura ended up being the 9th and final one during Father Junipero Serra's lifetime. They have some smart dogs in California - this guy was really cute at the drinking fountain. Then we moved on to Santa Ana, where we went to Disneyland. But there was the small Santa Ana Zoo across the street that we couldn't resist. Their specialty seemed to be unusual monkeys. And of course the bald eagle. We then moved to Oceanside, where guess what - there was another mission. Mission San Luis Rey, known as the "King of the Missions." It was the most impressive I've seen so far. It came along a little later in the string of missions, after Padre Serra'a death. Some of the old construction was still visible. The highlight of our stay in Oceanside was a walk out onto their pier. You could walk out so that you were even with the surfers. They were really fun to watch. And we weren't the only ones watching. The brown pelicans have their own roped off area, and you better not trespass, because apparently they bite stupid people. On our way down the coast, we stopped at Disneyland. It had been a long time since I'd been there, so I was ready to do anything and everything. Phil was really looking forward to going through "It's a Small World," but unfortunately it was closed. But I did enjoy the topiary garden there. Uh oh - looks like we're about to get eaten. But we're still smiling, because after all, it is the happiest place on earth. We decided to go to a show, Mickey and the Magical Map, in the Fantasyland Theater. It was really, really good. This guy sang for the lobster, while he was moving the lobster's mouth at the same time. Just amazing. Here's a short video of it. On to my favorite - Big Thunder Mountain Railroad. Then a lazy trip around the Rivers of America on the sailing ship, Columbia. Hold your ears, we're being attacked and fighting them off with the cannon. I liked Splash Mountain, even though I'm cringing a lot in the photo. We went to another show at The Golden Horseshoe. It wasn't very good, except for the fact that Phil was in the whole play! Why do they always pick him? Here's a 2-minute video of most of his part. He played a scary bear. The Haunted Mansion had a special show in honor of Halloween, "The Nightmare Before Christmas." At 4:00 it was time for the parade, led by the gang from "Frozen." Oh good, some characters I recognize! We saw Ariel from The Little Mermaid, and of course lots more. A great day! And the entrance to Oceano Dunes State Vehicular Recreation Area. You can even camp in your RV on the beach if you don't mind driving in sand. There is a fee for day use and camping. They were getting extra large waves when we were there. Saw these cute little guys - some kind of Curlew. Four miles north of the Hearst Castle is a pulloff where you can get close (on an overlook) to a huge herd of elephant seals. They are here almost all year, but this time of the year they are just resting. Only the seals that are too young to take part in the breeding season are here now. The best time to come is the birthing and breeding season from December to March. Birthing peaks in January. Some of the juvenile males are practicing their fighting. And they all like to flip sand over themselves. We also stopped at Mission San Luis Obispo, another one of Father Junipero Serra missions, this one founded in 1772. It was nice, but probably the least impressive of the ones we've seen. We also stopped to see Morro Rock, a 581-ft volcanic plug just offshore from Morro Bay. You know you're in California when you see a sign like this! I wanted to tour the Hearst Castle on our trip down the California coast, but first stopped in Cambria to see the "Poor Man's Hearst Castle." Otherwise know as "Nit Wit Ridge," it was built by Art Beal, a garbage collector, who bought the lot in 1928 and spent the next 50 years building his castle out of materials that others were throwing away. He also salvaged natural materials. One of those natural materials was abalone shells, which you can see here. And there are a lot of quaint folk art pieces, such as this deer. There were also a lot of toilets on the roof. I'm not sure what they were used for. The current owners work hard to maintain the property, and do offer tours. Unfortunately, we we there at the wrong time. They take you in a bus up the hill from the parking area to the castle. The Casa Grande is the centerpiece of the castle, at over 60,000 square feet. 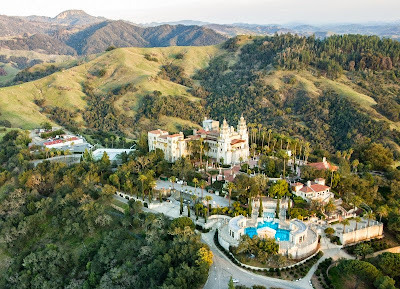 The castle was built over 28 years, from 1919 to 1947 for newspaper magnate William Randolph Hearst, who died in 1951. It looks more like a church to me. They only take you to a few of the larger rooms on the basic tour, the Grand Rooms tour. This was the dining room. He always had a lot of company. Beautiful old tapestries decorated the walls of all the rooms we went in. The Neptune Pool, with Roman pillars, was their little backyard swimming pool. It was empty when we were there because of the drought in California. Looking back at the Casa Grande and the Italian Cypress trees from the pool. The indoor Roman Pool did have water. People used to jump off that thing that looks like a balcony. Hearst used to have a private zoo and descendants from those animals still roam the grounds. On our way back down in the bus we saw a big herd of Barbary Sheep. Both Nit Wit Ridge and the Hearst Castle are California State Historical Landmarks.